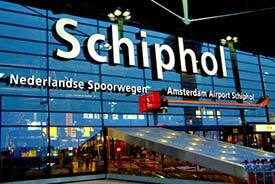 ABOVE: Schiphol Airport is one of the busiest international air gateways in Europe. INSET BELOW: A train in Centraal Station. An article from Europe for Visitors with links and photos. Plan your Dutch rail trip with the journey planner, and learn how to use the latest NS ticket machines. Engineer (engine driver) Rob Rijs describes what it's like to operate a Thalys high-speed train from Amsterdam to Brussels and back. Calculate your road route (with directions), or display a local map with optional listings from the Michelin Red and Green Guides. Amsterdam's modern cruise terminal in Ijhaven is used by approximately 100 ships carrying 200,000 passengers each year. The terminal is within walking distance of Centraal Station (which is only 20 minutes from Schiphol Airport), and its services range from bicycle rentals to free Internet terminals.